Jaafar Hassan, who goes by “Hassan,” recently joined WCC’s service dog training six-month internship program. Hassan brings a unique perspective to the position, as he spent nine years on active duty in the Air Force as a military working dog handler, before joining the Reserves. 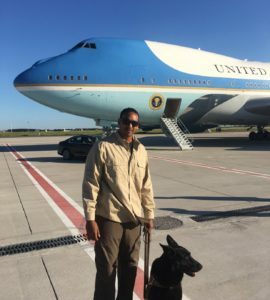 During that time, he worked with three different dogs as a K9 handler, helping to provide security, explosives detection and he even worked as part of President Obama’s security detail at one point. As he will tell you, making the transition from military working dogs to service dogs has been a big, but wonderful, change. Hassan and his wife, Tsegie, who is an occupational therapist, live in Silver Spring, Maryland. WCC also welcomed new Service Dog Training Instructor Andrea Celeste to its team. Previously a teacher for Montgomery County Public Schools, Andrea and her therapy dog, Grizzly, have done extensive work with students with special needs. She says the benefits of Grizzly interacting with nonverbal students had such a powerful impact on her, she knew long-term she wanted to become a service dog training instructor. 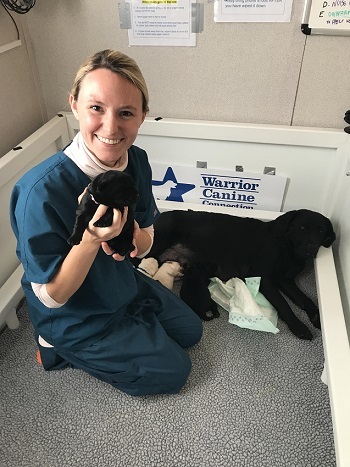 “It’s just so rewarding to see the benefits and rewards that a dog can bring to the faces of people working through challenges,” says Andrea. After teaching for two years, Andrea attended the Bergin University of Canine Studies and became a certified service dog training instructor. She says the new position is her dream job and a perfect fit for her. Born and raised in Bethesda, Maryland, Andrea graduated from the Univ. of Maryland with her Bachelor’s in Special Education and a Master’s in Severe and Profound Disabilities. Please join us in welcoming both of them to the WCC team!